A JetBlue A320 was executing a go-around as a Learjet 60 was departing from another runway. Following the investigation of five incidents in which commercial jetliners came within hazardous proximity of other aircraft while arriving or departing at major U.S. airports, the National Transportation Safety Board (NTSB) has recommended that the Federal Aviation Administration (FAA) modify the rules for air traffic controllers to ensure the safe separation of airplanes during go-around maneuvers. 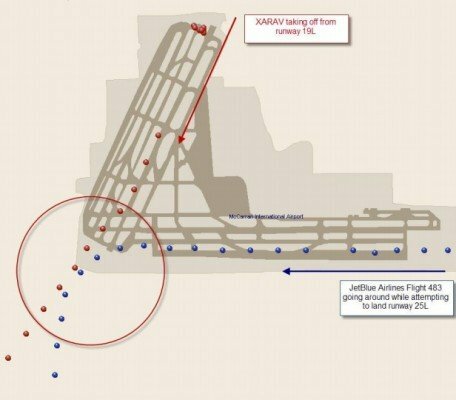 The safety hazard identified in the five incidents all occurred when an airplane that was on approach to the airport aborted the landing attempt and initiated a go-around maneuver, which put the go-around airplane on a flightpath that intersected with that of another airplane that was either departing or arriving on another runway of the same airport. Although current FAA procedures have specific requirements for ensuring the separation between two airplanes that are departing from different runways but that have intersecting flightpaths, they do not prohibit controllers from clearing an airplane to land at a time when it would create a potential collision hazard with another aircraft if the pilots of the landing airplane perform a go-around. In such situations, a flight crew performing a go-around may be put into the position of having to execute evasive maneuvers at low altitude and high closing speeds with little time to avoid a mid-air collision. The NTSB has determined that existing FAA separation standards and operating procedures are inadequate and need to be revised to ensure the safe separation between aircraft near the airport environment. The NTSB has recommended that the FAA modify air traffic control procedures so that an airplane that executes a go-around instead of landing as expected, will not be put on a potential collision course with another airplane either in the process of landing or departing. The incidents upon which this safety recommendation is based are listed below. On July 30, 2012, at 1:44 p.m., a Spirit Airlines Airbus A319 was executing a go-around as a Cessna Citation Mustang was on short final for landing on another runway. The two planes came within about 1,300 feet laterally and 100 feet vertically of each other. On July 30, 2012, at 4:04 p.m., an American Airlines Boeing 737 was executing a go-around as a Pinnacle Airlines CRJ 200 regional jet was departing from another runway. The two planes came within about 1,800 feet laterally and 300 feet vertically of each other. On July 14, 2012, at 11:44 a.m., an ExpressJet Embraer 145 regional jet was executing a go-around as an Air Wisconsin Canadair RJ was departing from another runway. The two planes came within about 1,000 feet laterally and 400 feet vertically of each other. On April 26, 2012, at 11:25 a.m., a JetBlue Airways Airbus A320 was executing a go-around as a Learjet 60 business jet was departing from another runway. The two planes came within about 1,800 feet laterally and 100 feet vertically of each other. On January 27, 2006, at 5:44 p.m., a near mid-air collision occurred when a United Airlines Airbus A320 was executing a go-around as an American Airlines Boeing 757 jet was departing from another runway. The two planes came within about 1,400 feet laterally and 300 feet vertically of each other.